Everything the dolphin does must be interrupted by its need to breathe. Dolphins breathe consciously, not unconsciously as humans do. The conditions present and time at which it takes a breath may be a life or death decision. Special receptor cells in the brain tell it when to breathe. As a result of evolution, its nostrils slowly migrated from its nose (or rostrum) to the top of its melon (head), making it easier to breath when swimming or resting partly under water. A dolphin takes only 0.3 seconds to exhale and inhale. A slightly recessed, crescent-shaped muscular flap called the blowhole is located on the dorsal side of the animal in the center of a swollen part of the head called the melon. The opening and closing of the blowhole is controlled voluntarily by the dolphin. Muscle contraction causes the flap to open, and relaxation of the muscle allows the flap to close in a water tight seal. The blowhole is the external opening (like a nasal passage) to the lungs. The dolphin forcefully "chuffs" or exhales when first surfacing for air to clear the recessed blowhole area of water. There is a network of complex nerve endings located in the region of the blowhole. These nerve endings sense pressure changes so the animal knows when its blowhole is clear of the water and it is safe to breathe. When a calf is first born, it has not yet developed the ability to interpret these pressure changes, so it must raise its head well above the water surface before each breath. This raising of the calf's head high above the water then bringing it back down to slap the water surface is called "chin-slapping". As it ages and can better interpret the sensation of surfacing, chin-slapping behavior ends and the calf breathes in the more typical fashion of taking in air as the blowhole first breaks the water surface. The following picture shows a newborn calf chin-slapping. The Atlantic Bottlenose Dolphin generally lives in the upper 10-150 feet of water, but may dive as deep as 2,000 feet. Dolphins have higher volumes of blood for their body size than do land animals, allowing for more oxygen carrying capacity during dives. Blood in the adult dolphin makes up 10-15% of its body weight, whereas in the human it makes up only 7% of the body weight. The dolphin's blood contains a higher concentration of red blood cells and hemoglobin than man's blood. Dolphins are able to store twice the oxygen in their muscles than can the human. By storing oxygen in their blood and muscles instead of their lungs, dolphins are able to be more efficient breathers than man. Also, during deep dives they can partially collapse their lungs and specially hinged ribs, adding to their ability to stay under water longer and withstand increasing water pressure in the ocean's depths. Although it can hold its breath for extended periods, it typically breathes from 1.5 to 4 times per minute. Adult dolphin dives have been recorded for as long as 15 minutes, although the more typically quoted maximum time it can spend underwater without breathing is about 7 minutes. Besides the features discussed above, the adult dolphin is able to hold its breath this long for a number of other reasons: (1) It is very efficient at removing oxygen from each breath of air, performing this function at an 80% efficiency rate compared to a 17% efficiency rate of the human respiratory system. (2) It can slow its heart rate from over 100 beats per minute to a rate of about 10 beats per minute to conserve oxygen. (3) It has the ability to move concentrated oxygen-rich blood from its muscle tissue into its inner organs to conserve oxygen and also to avoid risking nitrogen narcosis when rapidly surfacing from a deep dive. 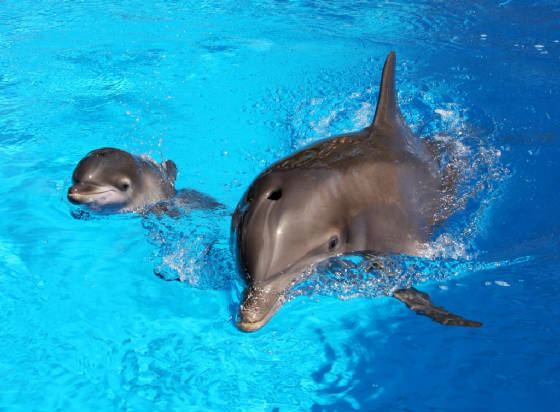 A calf, on the other hand, has lower concentrations of hemoglobin and is not able to reduce its heart rate to the extent that an adult dolphin can. Because of this, the calf is able to dive for shorter periods of time than can the adult bottlenose (newborn to 3 year olds can dive for 2 to 3.5 minutes; 3 to 12 year olds can dive for 4.5 to 5.5 minutes). Through its blowhole the dolphin inhales air containing vital oxygen and exhales respiratory wastes including carbon dioxide. Often a dolphin is seen spraying water upon exhaling. This water is not coming out of the animal’s lungs, as the inhalation of water into its respiratory system would be harmful. It is the way the animal, as it surfaces, removes the small volume of water sitting on the recessed surface of the blowhole valve so that this water does not enter the lungs when inhaling. If a dolphin needs to remove mucus or other foreign matter from its lungs, it exhales in a more forceful manner called a "chuff" or "honk". Frequent, forceful chuffing may be indicative of a respiratory health issue, such as a fungal, bacterial or viral infection. Because the dolphin has no sinuses or protective hairs by which foreign or infectious material may be kept from entering the lungs, it is vulnerable to respiratory infections. Anything the dolphin inhales goes directly into its lungs. Climates where there is high humidity and/or a significant amount of building construction taking place present greater chances for particulate inhalation by the dolphin. Also, and very importantly, the blowhole serves as the opening from which the dolphin’s vocalizations are sent. Because the dolphin does not have vocal cords as we do, it produces sounds through the movement of air in its nasal passages located below the blowhole within the upper portion of the melon. It vocalizes by pushing air back and forth between air sacs within these nasal passages. A complex of tissue called “phonic lips” project into the nasal passages. When air reaches these lips they vibrate, creating its sounds of clicks, chirps, whistles, squeaks, moans, grunts, and creaks.